Last Saturday it was looking like fall had passed us by and Old Man Winter was getting ready to settle in for good. Freezing rain and snow before Halloween?! It was the perfect day to stay inside and roast some pumpkins. 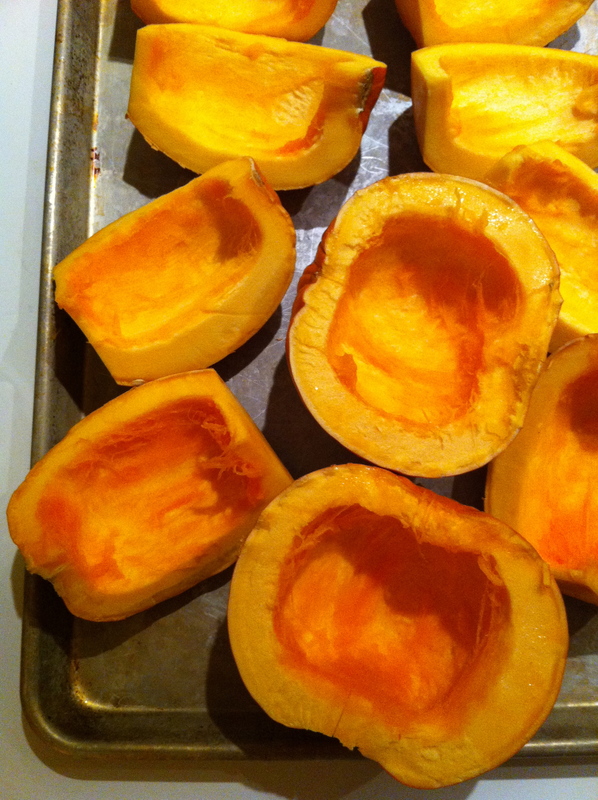 I followed the ever brilliant Pioneer Woman‘s advice for making homemade pumpkin puree. It couldn’t be easier! I’m never going to buy it in a can again! (Okay, that might be an exaggeration, but seriously, making it from scratch is very simple – seen here my pumpkins at the ready to be roasted.) As Hil had mentioned – these cute little guys are deceptive and can be a real pain to cut. Be careful! I followed Ree’s instructions and readied some puree for an autumnal pancake feast we were having on Sunday. Yum. butter and maple syrup of course! Join all the dry ingredients together in a bowl, sift or whisk to combine. Add in the pumpkin, cream, milk and eggs. Whisk until it’s smooth and incorporated. It’ll be thicker than your average pancake batter. Heat a non-stick skillet. Add butter and spoon in batter to make pancakes of desired size. When the sides start to bubble, flip. Enjoy with butter, maple syrup and friends. I originally doubled the recipe for our brunch party of 6 and had plenty left over to enjoy later. Kept safely in a mason jar it even made the move with me (I moved a few blocks down the street!). Nothing more comforting on these chilly mornings than warm, spiced pancakes. Mmmm. This entry was posted in Pumpkins and tagged breakfast, brunch, butter, cinamon, fall, maple syrup, pancakes, pumpkin. Bookmark the permalink.